One of our favorite summertime traditions is to host an end-of-the-school-year Ice Cream Sundae Party. It’s a wonderful way to celebrate summer break, and of course, an especially sweet way to beat the heat! There’s something extra special about savoring a spoonful of creamy homemade ice cream. It’s so refreshing! And when made with wholesome all-natural ingredients, it’s a special treat you can feel good about enjoying! Recently, all of our ice cream making dreams have come true with the addition of the KitchenAid® Ice Cream Maker Attachment for the KitchenAid® Stand Mixer. It’s so incredibly easy to use! Not only does it make deliciously smooth and creamy ice cream, but it also makes great gelato, as well as wonderful fruit sorbets and sherbet. With the easy-to-use KitchenAid® Ice Cream Maker Attachment, you’ll be churning out the most amazing ice cream concoctions like the recipe I’m sharing below – perfect for summertime or anytime you’re in the mood for a cool refreshing treat. The first step is to freeze the bowl for at least 15 hours. (We actually store ours in the freezer so it’s always ready to go whenever we’re in the mood for a frozen treat.) Then, make your ice cream, sorbet or sherbet base and refrigerate it until well chilled (preferably overnight). When everything’s ready, simply place the frozen ice cream bowl into your stand mixer, insert the dasher into the bowl and snap on the drive assembly, as shown in the photo above. That’s all there is to it. 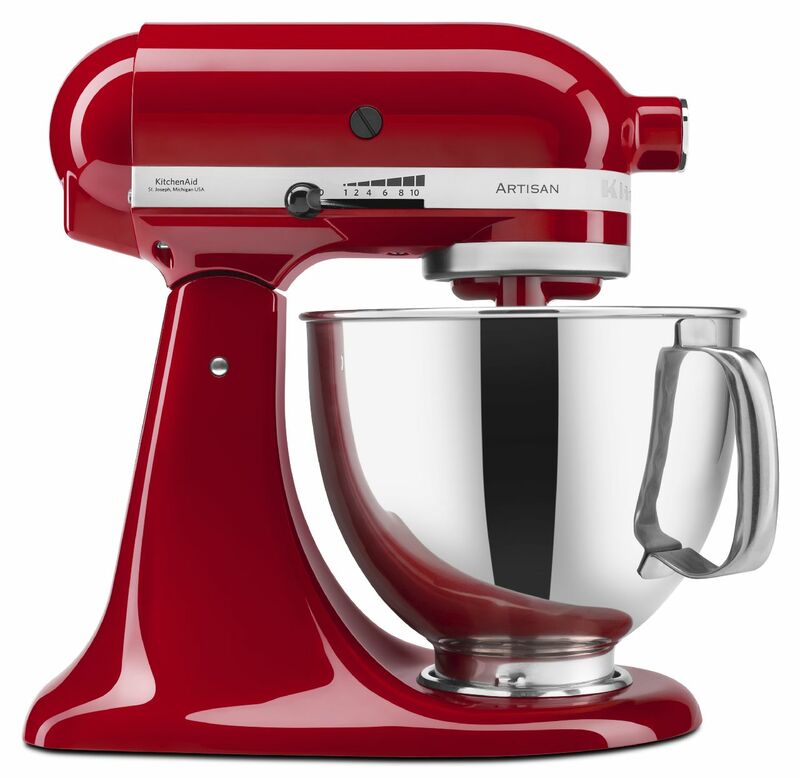 Of course, KitchenAid provides an easy-to-follow instruction manual, which makes this a quick and simple process no matter which model of stand mixer you own. The instruction manual also includes a variety of delicious frozen treat recipes to help you get started. Next, lower the motor head, making sure the drive assembly fits securely into the dasher. Place the locking lever in the “lock” position and turn on your stand mixer, making sure it’s set on “stir.” Then, slowly pour in your ice cream custard base. Typically, ice cream will set in about 20-25 minutes, depending on the ingredients and the temperature of your custard base. Once you’ve got your ice cream churned to perfection, you can either enjoy it right from the bowl for a delicious soft-serve style treat. Or transfer it to a freezer-safe container and freeze it for several hours until hard, as shown below. Then, set out your favorite ice cream toppings and let the party begin! 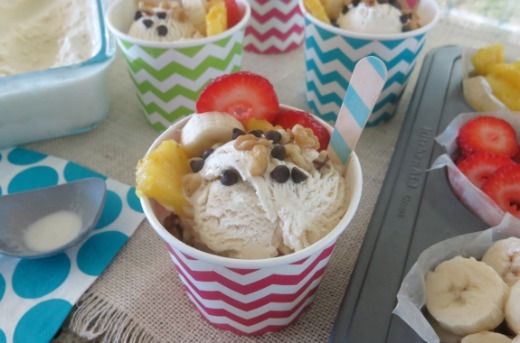 An easy and fun way to display ice cream toppings is to use a muffin tin. Fill it with your favorite ice cream sundae classics such as chocolate chips, assorted nuts and diced fruit like strawberries, pineapple and banana. 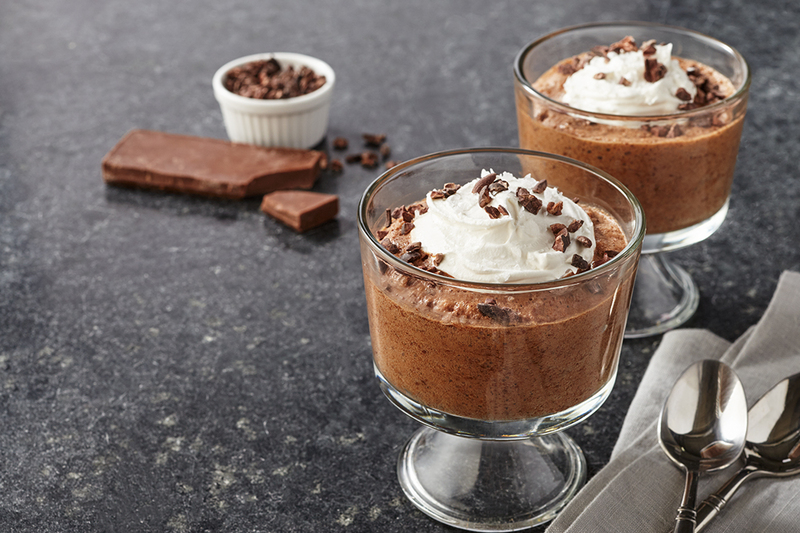 All that’s left is some whipped cream and cherries and you’ve got it covered – literally! Plain ole vanilla isn’t so plain when paired with an assortment of tasty toppings. Of course for those of us who adore vanilla bean ice cream, there’s nothing plain about savoring it solo. But of course, toppings certainly do add to the fun! In a large saucepan over medium-low heat, whisk together the cream, milk, maple syrup or honey (*see note below) and vanilla bean pod and seeds. Continue to whisk, making sure that the mixture does not come to a boil; reduce heat if necessary. In a small bowl, gently whisk the egg yolks. Then, slowly drizzle a half-cup of the hot cream mixture into the yolks while rapidly whisking. Pour the yolk mixture into the hot cream; whisking constantly to incorporate. Using a wooden spoon, continue to stir the custard. It will begin to get steamy and foamy as you stir it, but do not allow it to boil. Once the custard begins to thicken slightly and coats the back of the spoon, remove the saucepan from the heat and stir in the vanilla extract. Place a fine-mesh strainer over a heatproof bowl and pour the custard through the strainer in order to remove the vanilla bean pods and any cooked egg yolk bits. Assemble the KitchenAid® Ice Cream Maker Attachment in your KitchenAid® Stand Mixer, following the directions provided in the instruction manual. Then, slowly pour the cold custard into your frozen ice cream maker bowl and freeze the custard to desired consistency. Once the custard is frozen, enjoy it immediately for a delicious soft-serve style treat. Or place it in a freezer-safe container and allow it to harden in the freezer for at least 3-4 hours. Then, scoop and serve with your favorite toppings. *Recipe Note: For naturally-sweetened ice cream, use pure grade A maple syrup, or a mild honey such as clover. 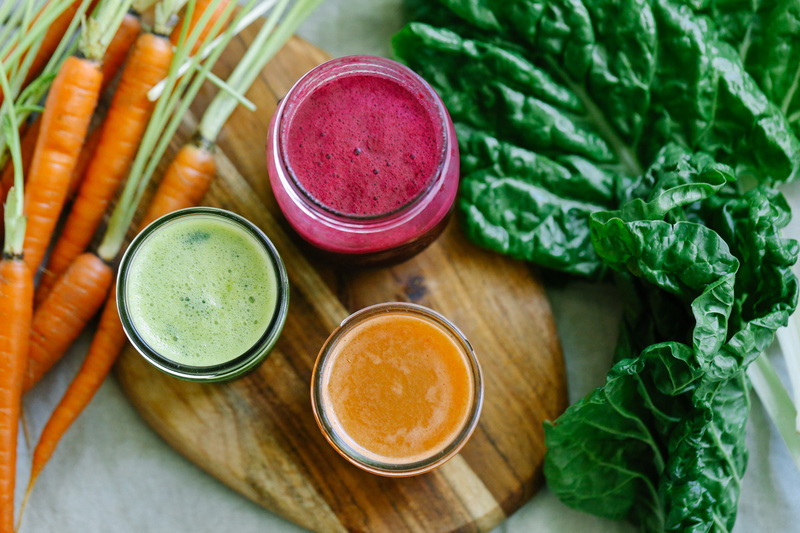 Either option provides a light and delicious all-natural sweetness. Thanks so much! I appreciate your kind words! Happy summer! Looks fun Kelly! Great job! I’ve always raved about the KitchenAid ice cream bowl. I’ve been using it for over 5 years (I have 2 actually!) for all my homemade ice cream. Your recipe sounds delicious, Kelly, and I love your sundae set up (and cute cups!). Thanks so much, Nicole! Sounds like you are a true ice cream connoisseur! Thanks for sharing! I have a Kitchen Aid, but didn’t know there was an ice cream attachment. I will have to look that up. What a great way to end the school year! I will do that next year! Thanks, Shonda. I am sure you will have lots of fun too with the ice cream attachment. Happy summer! How do I not already have an ice cream attachment for the KitchenAid?! I need this! Beware my friends. I’m a home store sales manager for the housewares department and for years when a customer comes in looking for a stand mixer I have always suggested kitchenaid and would joke that you would have to leave it on your will for they will outlive you we’ll guess what can’t use that line anymore I had a problem with mine the pin that holds the base to the top came out while I was using the machine what a mess a friend of mine the little plastic knob broke off and now the speed crank gets stuck when he try’s to use it there customer service tells you to send it in with $35.00 and they’ll get back to you with how much it would cost to repair. 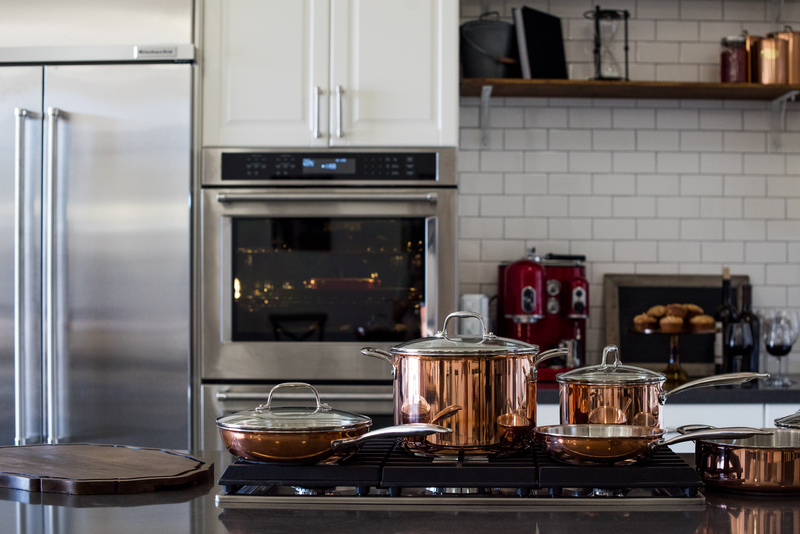 The only lines I trust are all clad, anolon and Oneida for the back their product for life. That’s what happens when American products start been made over seas the quality goes down so if you have your grandmothers kitchenaid mixer treasure it and hope you never have to replace it with a new inferior quality one. By the way all clad is 100% American made and worth every penny. Hi Rome, we are terribly sorry for this inconvenience. It is normal over a period of time for the mixer to need to be adjusted. The first process to use is for the hinge pin adjustment. http://youtu.be/_qioHm1PQns and the second process is to check the beater to bowl adjustment, http://youtu.be/-Layicb8-jE. Love the idea of an attachment for an appliance I already use and love, instead of a completely different machine that does just one thing! Kelly, your recipe looks delicious. Simple ingredients that are easy to find, and toppings that are already in my house? Absolutely perfect. Thank you for the step-by-step tutorial, and the great party idea to celebrate the start of summer! How did I not know that Kitchaid had an ice cream attachment? Your ice cream looks so yummy! !